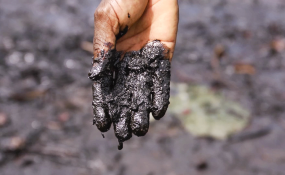 Pastor Christian Lekoya Kpandei's hand covered in oily mud, Bodo Creek, in 2011. His fish farm once provided a living for about 30 families. Its collapse forced him to move to a single-room apartment, to pull his youngest child out of school and left him with no regular source of income. The leakage has adversely affected the fishing vocation of residents who had withdrawn from fishing to pave way for clean-up. The resulting oil spill impacted and polluted an estimated area of 113.03 hectares, according to a joint Investigation Visit (JIV) report of the incident obtained by News Agency of Nigeria (NAN) in Yenagoa on Monday. The refusal was attributed to wide disparity between the impacted areas claimed by Shell and the community, but Bamidele Odugbesan, the Media Relations Manager at SPDC, said that the grey areas had been sorted out. The report indicated that only 247.5 out of the 1,114 of SPDC's crude blend had been recovered at the spill site, while the remaining were yet to be accounted for. The report said the spill was caused by equipment failure resulting from weak integrity of the 24 inch Trans Ramos Pipeline giving rise to cracks on the pipeline at Aghoro in Ekeremor Local Government area of Bayelsa State. Reacting to the development, Mr Odugbesan expressed regret about incessant spills on the Trans Ramos Pipeline, saying that although the May 17 spill was traced to equipment failure, other leaks were predominantly caused by sabotage. "The rate of spills on the Trans Ramos Pipeline is very worrisome, for instance between April and May 26, spill incidents were reported on that line and out of these, 18 of them were caused by sabotage, eight were operational," he said.